We succeeded in improving 7digital’s music search results accuracy by using customer feedback, application monitoring and metrics, and continuous delivery. A major factor in allowing us to complete the task was our Continuous Delivery pipeline, comprised of an automated Teamcity deployment process and a test environment which was effectively identical to our production environment. From the git push of our tests and code, it took 15 minutes to deploy changes to Production. The work flow was automated in the test environment and then finally deployed to production with a human clicking the deploy to PROD button. From the push, code was compiled, unit and integration tests were run, the application was deployed to test environment automatically and then acceptance tests were run on the test environment. We would routinely then deploy the new code to only one server in the cluster as a “Canary release” a.k.a “canary deploy” and monitor that server for 10 minutes to ensure it had not adversely affected performance. If the change was for the worse we could immediately roll back the change and deploy the previous version of the code on the “canary server”. Otherwise after monitoring performance, we would deploy the new code to the remaining production servers, and let our users enjoy the new improvement. The rapid feedback allowed for multiple deploys to production to be made a day, with low risks of errors, since we practised Test Driven Development. Beyond the response time, we wanted to analyse the accuracy of the search results themselves on production. To that end we used our Logging Platform built on the ELK stack (Elasticsearch, Logstash, Kibana) to see what the most common search results were, what number of queries were yielding 10 or fewer matching results, all in near real time. We called this Kibana dashboard our Search quality dashboard. We measured success by the reduction of query time and improved accuracy of results. As part of the acceptance tests we created acceptance tests which tested the search results for a list of given terms. Lucene is a full text search engine. A document is sent to Lucene. Lucene will look at the document, analyse it’s fields, convert the text in the fields into terms (a process called tokenising) and store those terms with the document into an index. An index can contain millions of documents. This process adding documents to an index is called indexing. Search terms can be sent to a index to query it. Lucene will return any documents that have terms matching the search term. SOLR is a web service which wraps around a instance of Lucene. One can send documents to SOLR via HTTP and it will add those into a Lucene index. Queries can also be sent over HTTP to the Lucene index via SOLR and SOLR will return the search results via HTTP too. The index can be administered via HTTP requests sent to the SOLR web service. For our track & release indexes, creating a new index of the music catalogue on a regular basis meant we could take advantage of the index time features that SOLR offers. Searches for track and releases used both SOLR and the internal Web API. The catalogue Web API can accept up to 500 release or track IDs in a single GET request and return the metadata for all of them in a single response. The catalogue API would only fetch the content if the IDs were valid, but would also filter those results based on the complex licensing agreements 7digital have with both the music labels and 7digital’s clients. it was quicker to reflect catalogue updates, as the track details were served from the SQL database which could be updated very rapidly. 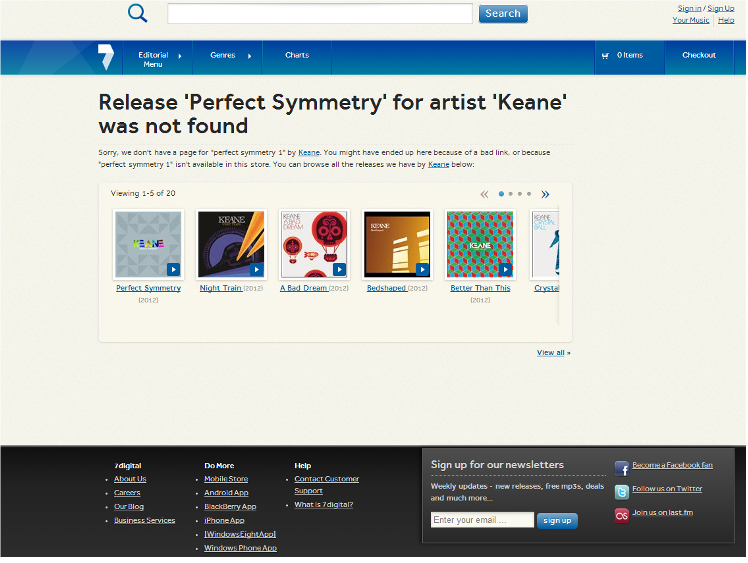 Prior to the start of the redesign of 7digital’s catalogue search service, clients had complained that the accuracy of the search results for track and release searches was not useful. After gathering feed back from users, both internal and external to 7digital, we came up with a list of specific search terms and the expected results, none of which the search algorithm was returned. We sought to remedy this. This was achieved by modification of the Lucene’s term frequency weighting in the similarity algorithm. It transpired that to meet our customers expectations we would have to delve into the inner workings of SOLR and Lucene to override the default search behaviour. Search quality dashboard enabled us to view how search terms were received from clients and how a SOLR query was built and then sent to our SOLR servers. 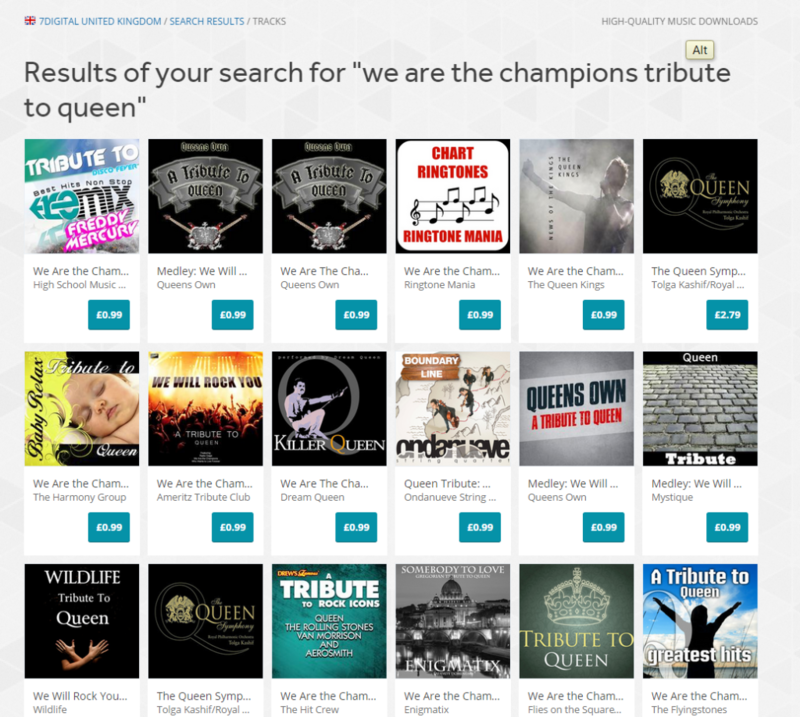 Some labels deliberately publish tribute, sound-alike and karaoke tracks with very similar names to popular tracks, in the hope that some customers mistakenly purchase them. These tracks are then ingested into our platform, and 7digital’s contract with those labels means we are obliged to make them available. At the same time, consumers of our search services complain that the karaoke and sound-alike artists are returning in the search results above the genuine artists, mostly because of the repeated keywords in their track and release titles. In order to satisfy both parties, we decided to override default Lucene implementation of search and exclude tracks, releases and artists that contained certain words in their titles, unless the user specifically entered them in as search term. 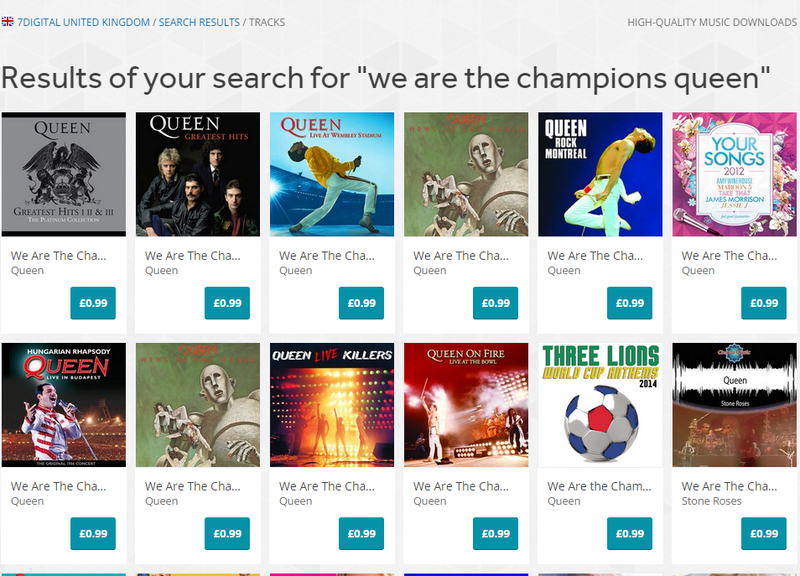 For example, searching for “We are the champions” now returns the tracks by the band Queen, which is what customers expect. To achieve this we tweaked the search algorithm so all searches by default it will purposefully exclude tracks with the text “tribute to” anywhere in their textual description, be it the track title, track version name, release title, release version name or artist name. Other music labels send 7digital a sound-alike recording of a popular track, and name it so it’s release title and track tile duplicate the title of a well known track. By ranking results by popularity, the releases with deliberately misleading titles would rank lower in the search results as our customers tended identify the originals and play and purchase them more frequently that the sound-alike releases. This would mean those releases would be calculated to become more popular and at the next index rebuild time would find themselves higher in the search results, thus inducing a virtuous circle. Lucene is a capable search engine which specialises in fast full text searches, however the documents it is designed to search across work best when they are paragraph length containing natural prose, such as newspaper articles. The documents that 7digital add to Lucene are models of the metadata of a music track in our catalogue. Standard implementation of Lucene will give documents containing the same repeated terms a higher scoring match than those that contain a single match. This is means when using the search term: “Michael” results such as “The Best of Michael Jackson” by “Michael Jackson”, will score higher than “Thriller” by “Michael Jackson” because the term “Michael Jackson” is repeated in the first document, but not the second. We solved this issue by overriding the default similarity algorithm in Lucene for our installation of SOLR. With regard to matching text values this makes sense, but for a music search we want to factor in popularity of our releases based on sales and streams of it’s tracks. Ignoring popularity leads to a poor user experience; since “Best of Michael Jackson” release is ranked as the first result, despite being much less popular than “Thriller” which is ranked lower in the search results. These terms would not be returned in a search result, but were likely to match a user’s search term. We also added functionality to support auto-complete style searches. Partial search terms could be sent to SOLR and by using Edge n grams filters at index time to create terms we achieved a simple prefix search. For a document, a shingled and prefix field was added along with fields which were analysed by the standard filters. At query time we could alter the weighting of how important a field was to be when generating the SOLR query. One useful tokeniser was the Text shingling filter which when applied to track titles such as “How Big, How Blue, How Beautiful” by Florence + The Machine. Given that there are 40 million tracks in the 7digital catalogue, there is almost endless scope for tweaking the search results. Improving the search algorithms in Lucene to maximise customer happiness was an engaging experience, with the talented team at 7digital I found it to be a highly enjoyable time. We certainly left the music search in a better state than we found it. And of course, we could upgrade it to Elasticsearch for even more features…. I’m Michael Okarimia, and since January 2014 I’ve been in role of Lead Developer of the Content Discovery Team at 7digital. The Content Discovery team recently improved the catalogue search infrastructure for the 7digital API. This is the first of a series of posts which describes how we made 7digital’s music search usable for our users and clients. This is a three part series of posts which describes the work we’ve done on 7digital’s search platform. Searching for a music track in 7digital’s API is often the first point of contact for accessing its catalogue of 27 million tracks. The API that 7digital provide has many publicly accessible web services which are reached via a specific URL, which we refer to as API endpoints. To stream or purchase a track, one first needs to know what it’s 7digital track ID is. 7digital track IDs mean nothing to the average end user, so searching for a track based on its track title and/or artist name is a very common method of retrieving a 7digital track ID. The client consuming the API can then use this 7digital track ID to access a the music streaming service on the streaming API endpoints. The title, artist, price and release date of a track is referred to as track meta data, which is data pertaining to the track, but not in itself the audio file of the track. The Track search endpoint, as it’s name suggests, accepts search terms as text, and returns in the it’s search results the metadata of any matching tracks. It was powered by web servers which sent its search requests a SOLR web application. SOLR provides http access to a Lucene search index, which is a very widely used piece of text search software. Some examples where Lucene is used are for searching for words that exist in a collection or books in a library. Many people will be familiar with a search engine on Twitter or Wikipedia, which uses Lucene to search for specific pieces of text in a massive corpus of text. Search results often were wrong, out of date, or would return errors. This was due to the platform having a separate search database and a catalogue database, which contained different results for the same content. The search database was updated in a different manner to the catalogue database and they were not always consistent with one another. More on that later. Why was search so slow? The meta data of the tracks was stored in a search index that was 660Gb in size, which is extremely large compared with many search indexes. Various tweaks to JVM and memory settings were made but they did not make a permanent improvement for very long. 660 Gb is very large for an Lucene search index. Why was it so big? The Index size was 660Gb, containing 660,000,000 documents. Each document represented all the meta data for a single track. It’s slow, so why not improve the hardware it was running? A copy of the SOLR Index was replicated onto four physical servers, 24 cores each, 128 Gb RAM with 1.9TB storage on SSD discs. The server hardware the SOLR servers ran on were upgraded, initially from smaller virtual machines to larger ones, and then later on physical hardware. This was not cost effective given the response time performance we had! If 7digital ‘s catalogue contains 27 million tracks, and one document represents a single track, then why were there 660 million documents in the search index? In the response there are 29 fields representing a track. Every one of the fields in the API response was stored in the Lucene search index. However a search will only match search terms against fields such as track title or artist name, rather than bit rate or image url. The structure of the track index was such that the data was denormalised. A track could be available in any of the 44 territories 7digital operate in. There would be one track document for each track, multiplied by the number of territories the track was available in. In order to make a single track searchable in all territories there would be 44 documents added to the index. Almost all the field values in those a track documents for a given track would be identical, apart from fields specific to a territory like the price, currency and release date. The reason for the huge search index size was that it was being used as a document store as well as search index. It worked accurately as a document store, but poorly as a search index for reasons of performance. Unlike some other nosql use cases, there were almost always more tracks being added and an hourly basis. and very few being removed; every day sees more music released worldwide. How were these 27 million tracks turned into a searchable index? Updates to the index were incremental, minute by minute changes to the catalogue were sent via http to the master SOLR server which turned the data into a single index. This master server did not serve any search queries. That work was down by four other SOLR servers which periodically copied the index from the master SOLR server. These four servers are known as Slaves. Replication from the master SOLR server to the slaves would take around 30-60 minutes, depending on the volume of changes. Due to the incremental updates to the Lucene index, the number of track documents increased on hourly basis. Within the Lucene index the maxDocument count exceeded the number of searchable documents by a large margin. In Lucene, maxDocument count is simply the number of documents in the index, but this includes deleted ones too, which will not be returned in a search result. 30% of the 660Gb index contained deleted, non-searchable documents. The deleted documents used disc space and hurt search performance. On a previous occasion in 2013 running a Lucene optimize command on this Lucene index took over 24 hours and prevented any new tracks to be searchable. Doing this regularly was not possible if the organisation needed updates on an minute by minute basis. The deleted documents remained in the search index, gradually over time the index was getting bigger. In six months it increased by 160Gb. So what was the problem with updating the index with new tracks as they were imported into 7digital’s platform, incrementally? Data consistency! The delay between a track changes made on the source SQL database and the time it took to propagate into the SOLR slave servers would be at least two hours. There were many times when the change would be effected in the SOLR index, meaning resulting in poor user experience. Why not create the entire index all at once, rather than sending constant updates? Wouldn’t that reduce the index size and help performance? Yes it would. This was attempted in 2013 by it took around five days to complete, during which this time no new tracks could be added to the search engine. The alternative is was to acquire another large server with a Terrabyte of storage space and index the track data to there, but this still took five days. At the end of that process you would have an index with no deleted documents, yet it would be nearly a week out of date. This was clearly not acceptable for a fast moving multinational music market. Now I know why search was so slow. Why were the search results often wrong? The data returned from the search result was retrieved entirely from an single document in the Lucene index. Almost all of the other non search catalogue API endpoints were querying a different SQL database, which was the original data source for metadata. Given the time it took for the data to be read from the original SQL database, posted into the SOLR master server and then replicated to the slave servers, there would often be a gap in time before the two databases were consistent with each other. Occasionally a update would not make it to the SOLR slaves, and there search API would return stale results which would have to be manually updated. Sounds like a nightmare. How did you solve these problems? You are currently browsing the archives for the Lucene category.